This paper aims at discussing Shirley Geok-lin Lim’s 1996 memoir – Among the White Moon Faces – as inviting a conceptualisation and examination of lineage conceived otherwise than (only) on a biological mode. I am interested in showing that when the question of filiation is examined from a literary perspective and focuses on different possible relations to a writer and a narrative belonging to a different generation, it is also intimately related to an attitude towards cultural heritage. My basic postulation is that references to The Woman Warrior: Memoirs of a Girlhood among Ghosts, a seminal and uniquely innovative work in (Chinese) American letters are visible on a double level, diegetic and extradiegetic, and weave a fruitful relationship not only with the conceptualisations of self-representation that emerge in Kingston’s first opus, but also with the narrative and discursive configurations that sustain them. By tracing and analysing these different echoes and resonances it will be evinced how in Lim’s and Kingston’s case, the questions of heritage or, forthat matter, the one of transmission, go beyond the simple following in someone’s footsteps or unilateralism to which they are usually reduced, weaving into the literary field other connections than those established by chronology or aesthetics. Nicoleta Alexoae-Zagni is currently a lecturer in a French Higher Education College (ISTOM) and a researcher affiliated with CREA (Paris Ouest Nanterre University). She received her PhD in AmericanStudies from the University of Paris Diderot in 2011. She has been active in the field of Asian American Studies –she has been involved in academic events, published several articles and presented papers on subjects relative to her area of scientific investigation. Her most recent contribution is the volume edited with Sämi Ludwig On the Legacy of Maxine Hong Kingston: The Mulhouse Book, published in January 2014 by Lit Verlag,in the series Contributions to Asian American Literary Studies. Copyrights of all materials published in Asiatic are held exclusively by the Journal and the respective author/s. Any reproduction of material from the journal without proper acknowledgement or prior permission will result in the infringement of intellectual property laws. 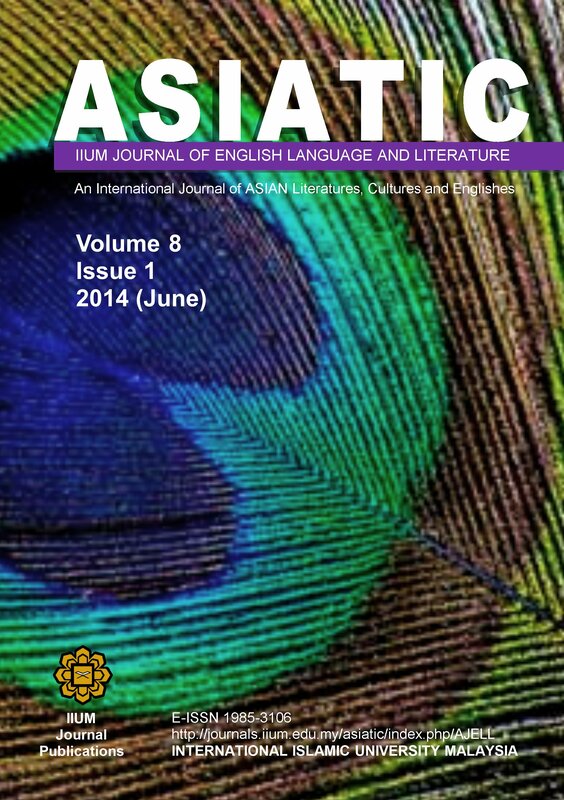 Asiatic at http://journals.iium.edu.my/asiatic is licensed under a Creative Commons Attribution 4.0 International License.